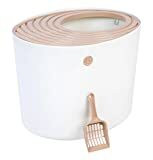 The folks at Arm & Hammer make a top entry cat litter box to help reduce litter scatter and urine spray. It includes antimicrobial protection that inhibits odor, and a molded-in hook for litter scoop storage. The large top opening fits most cats, including larger ones. It has special grating on the lid that allows litter to fall back inside when opened. Its design also helps discourage dogs from digging through the litter. 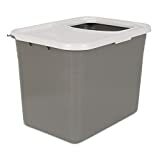 Be sure to see the Amazon customer reviews for the Arm & Hammer top entry litter box. 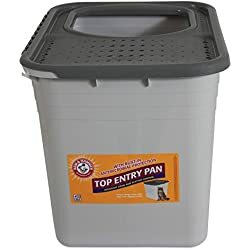 You can see Arm & Hammer top entry litter boxes on eBay here. Who Is Arm & Hammer? 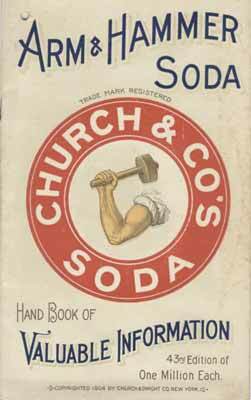 Arm & Hammer is a brand of household goods made in the USA by the manufacturing company Church & Dwight. Originating in the 1800s, the Arm & Hammer brand was originally known for its baking soda, but over time expanded into other household items such and laundry detergent, deodorant, and more, including a well-known line of products for cats that include cat litter and cat litter boxes. Arm & Hammer’s “Hand Book Of Valuable Information,” circa 1904. Although originally best known for baking soda and washing soda, Arm & Hammer today is well known for a variety of products for pets, including a popular line of cat litter as well as their top entry litter box.